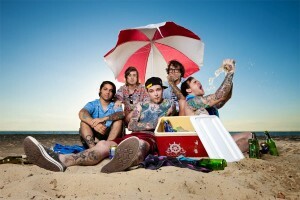 The Amity Affliction are currently poised to release their third studio album, Chasing Ghosts. For those of you lucky enough to be living a little bit closer to the band, you can expect for the album to be released pretty early. Chasing Ghosts will be released in Australia on September 7, in the UK on October 1 and in the US on October 2. They’ve already released the title single for everyone to check out. As of today though, you can now check out another track off the album titled “RIP Bon”. The song, according to a post about the song, is named after Ahren Stringer’s late cat, who was named for AC/DC’s late Bon Scott. You can listen to the song by checking below the jump. TAA will embarking on a pretty sizable tour starting this September in Australia, and ending in the US this November. Look below the song to see a full list of tour dates the band has planned so far. Be sure to pre-order the album if you haven’t already. You can pick up a bundle or one of a limited amount of colored vinyl. You can get your pre-ordere here.